The best of both worlds! This unique blind takes on the soft fabric look of a cellular shade when it's closed and has a familiar flattened blind slat when opened. Expanded 1" cells to provide significant insulation for year round energy efficiency. Certified: GREENGUARD Indoor Air Quality Certification Program.  for low emitting Products. BlindsMax is proud to introduce the world's first and only insulating blind. 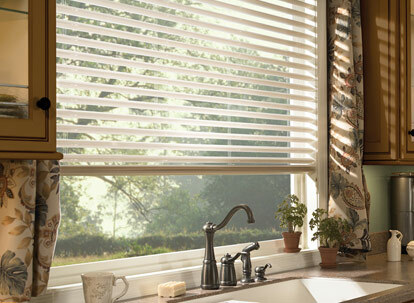 This unique blind is made with the soft fabric look of a cellular shade when closed and has a familiar flattened blind slat when opened. It works by expanding the vanes as you close the blind from flattened slats into one inch honeycomb cells. 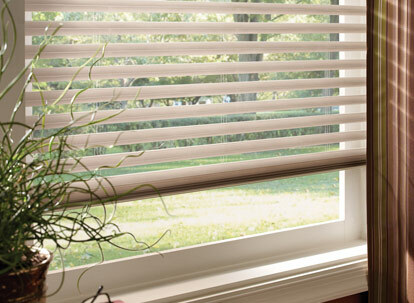 BlindsMax offers these blinds with a max dimension of up to 108" in width and a height of up to 120" total. The insulating feature of this cellular blind allows for full privacy and blocks drafts for better energy efficiency. Heat gain and heat loss is also minimized due to the nature of the expanded cell which creates much needed insulation for the window. This blind is available with light filtering or room darkening fabric choices in a huge variety of colors, and is white on the outside of the blind for a uniform exterior appearance. Did you know that around 40% of a home's heating and cooling energy can be lost through even the most well installed windows if no insulating window treatments are used? A window is simply not as well insulated as the walls of a home. Our insulating blinds work to efficiently block heat gain and damaging UV rays in the summer, and heat loss in the winter. Unlike your typical cellular shades, insulating cellular blinds allow for more natural light and a better view during the daylight hours while providing you with all the benefits of cellular shades when you need them most. Insulating cellular blinds come with a lifetime-limited warranty and are one of our highest quality window coverings. In addition to this high quality product, we also include fast free shipping on every order and no sales tax on orders outside Tennessee (State law dictates we must charge tax to customers in Tennessee). Plus with our low price guarantee, you know you are going to get the very best price on your window fashions. Your 100% satisfaction is our top priority at BlindsMax. If you have any questions or would like friendly personal assistance with your order please click on the live help button above, or call us anytime Monday through Friday between 9am and 5pm EST at 888-305-8020. In addition to residential orders we also work with contractors in many industries on large project bids.